ENB-TENN:தமிழீழச் செய்தியகம்: What Does France's President Want to Achieve in China? What Does France's President Want to Achieve in China? On the eve of President Macron’s visit to China, the relationship is caught between expectations and frustrations. President Emmanuel Macron has chosen: He will go to China for his first visit to Asia. To those around him, who argue for a strengthening of ties between Paris and Beijing, it is an obvious choice. China is the second largest economy in the world; its overwhelming “Belt and Road” project seems to offer unlimited opportunities. And of course, for France, which has the ambition to play a global role on the international scene, China seems to be the right partner: a nuclear power and permanent member of the United Nations Security Council, with a veto right that weighs on all major decisions. 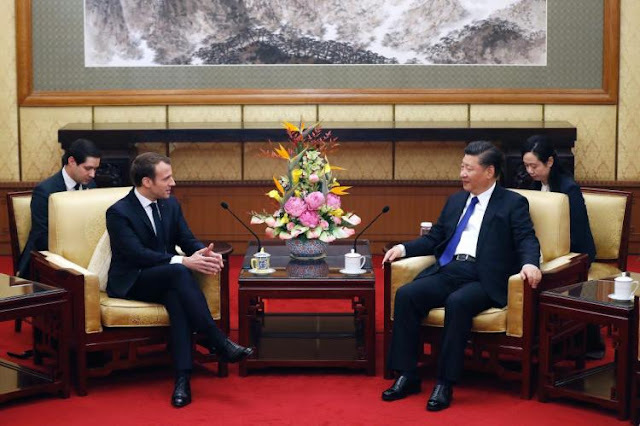 Moreover, for a French president who wants to assert himself as the antithesis, if not the equal of U.S. President Donald Trump, “mighty China” offers the opportunity to play that role. much more about Europe and its environment than about faraway Asia. posture of the United States, and to implicitly recognize by his choices the pre-eminence of China in the region. Macron may be all too ready to welcome that role. characterize the Sino-French relationship have not disappeared. (a French concept) of the United States. This, without stressing the fact that, if China is favorable to the “democratization of international relations,” its only objectives are actually to increase its room for maneuver by driving a wedge between like-minded liberal democracies, and to establish itself as the uncontested leader of the Asian pole. and its strategic and economic consequences, cannot be avoided. France is the only European country with direct territorial interests in the Asia-Pacific. By multiplying military cooperation deals, with Australia, Indonesia, or India for example, or maybe tomorrow with Japan, France also plays a major role in defense capacity building in the region. As such, and because of its position in a post-Brexit European Union, and at the UN, what France does is of interest to countries whose primary strategic objective is to balance a Chinese power obsessed by its own strategy of “rejuvenation” through assertiveness. any strategy of division between individual members of the European Union to gain better access to benefits. its own development, particularly in advanced technologies, at the fringe of the civilian and the military. capacity that Paris will demonstrate — by concrete actions — to maintain a necessary balance between the powers of the region. Valérie Niquet is a senior visiting fellow at the Japan Institute of International Affairs and head of the Asia department at FRS (Fondation pour la Recherche Stratégique), Paris.